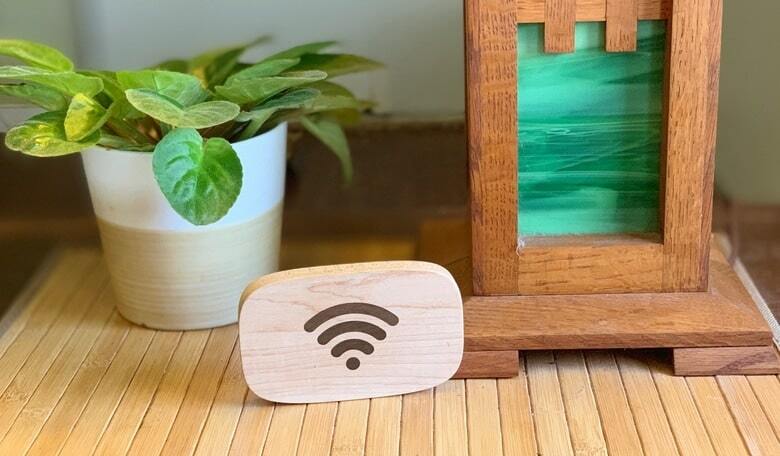 The Wifi Porter might not be what you think; it’s not a small Wi-Fi bridge or repeater. Instead, it transfers the details of your wireless network to the phones or tablets of visitors. Exactly how this transfer is done depends on the device. This accessory uses NFC (Near Field Communications), a wireless standard mostly employed for digital payments. Despite this, Apple doesn’t seem to trust NFC very much. As a result, the Wifi Porter NFC function only works with the 2018 iPhone models. And even then it’s kind of a hassle. Fortunately, there’s a second method. This is the only option for iPhones from 2017 or earlier, and all iPad models. And it’s much simpler. The Wifi Porter configuration software can generate a QR code (sometimes called a 3D barcode) that contains your login details. Ten One Design built a way to display this QR code into its accessory (more on this in a bit). So getting connected just requires using the camera in the phone or tablet to scan the QR code. The situation is completely different for your friends, guests or customers who use Android phones with NFC. A double-tap of the device on the Wifi Porter and they are good to go. That said, not every Android model has NFC. Anyone using a budget handset or a tablet might need to scan the QR code with their camera app. Happily, this is just as easy. Mac and Windows users don’t get things as easily. They’re still going to need type in the Wi-Fi password. That’s why the login details get displayed next to the QR code on the back of the Wifi Porter. This also benefits anyone who can’t make scanning the code work. That said, the configuration app gives the option of not displaying this information, which means people can only log in via NFC or QR code. Wifi Porter is easy to see without being intrusive. The iPhone’s NFC problems actually get worse when it comes to setting up the Wifi Porter. Apple limits NFC to reading information, not writing it, so an iOS device can’t be used to configure the wireless transfer of network details. There isn’t anything Ten One Design can do about this; the limitation is baked into the iPhone. 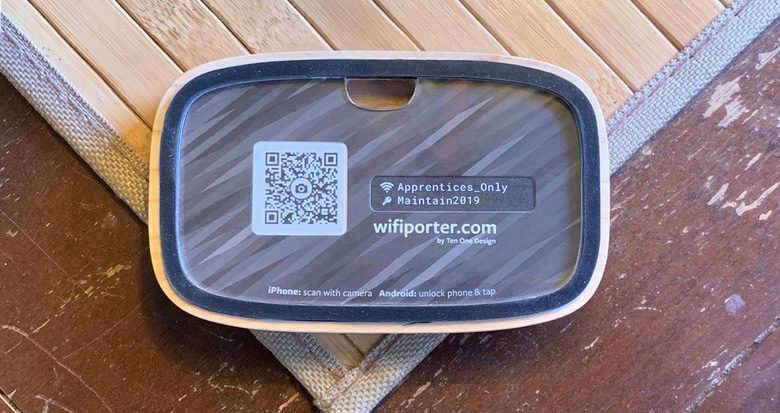 Still, you can use the free Wifi Porter software to produce the QR code that your guests can use to quickly and easily set up their devices, both iOS and Android. This can be printed, cut out and placed on the back of the Wifi Porter hardware. Because of those iOS limitations, setting up NFC for the cool tap-to-transfer feature requires an Android handset. The version of the setup app from the Google Play Store walks you through the process of configuring the NFC function, as well as creating a QR code. This takes just a minute or two, and the Android device isn’t needed again unless you want to change the Wi-Fi password. If you don’t have access to an Android phone with NFC then you’ll just be using the Wifi Porter as a way to display a QR code. While the hardware for this accessory is quite cool (more on this later), you don’t have to buy one to just give people a 3D barcode to scan. Head to QR Stuff, a website where if you enter your wireless network details you’ll be presented with a QR code you can download. Stick this up somewhere prominent and people can be connected to your Wi-Fi network in a flash. All for free. Ten One Design says “We make remarkable tools for remote work.” The design of the Wifi Porter is quite remarkable in its simplicity. 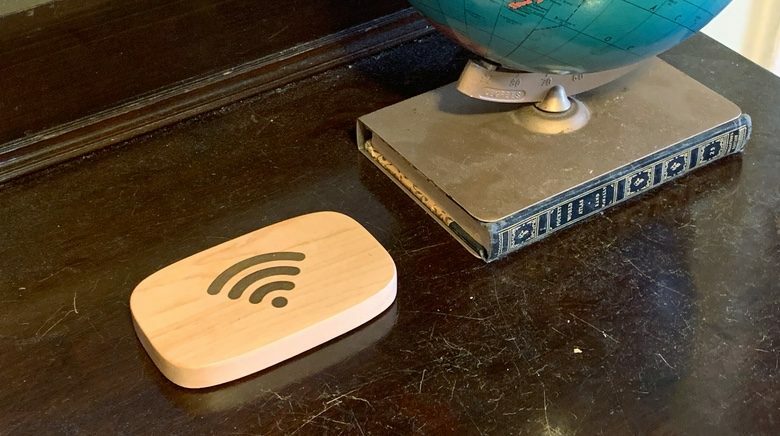 It’s really just a block of wood with the Wi-Fi logo printed on the front but there’s just something right about it. At 4.5 inches by 2.8 in. by 0.6 in., it’s the perfect size to hang on a wall or leave on a table. It’s large enough to easy to find without being intrusive. If you’d like something fancier, Ten One Design teamed up with Distil Union to create a limited-edition Wifi Porter with an Italian leather surface. If NFC doesn’t work, Wifi Porter helps you create and display a QR code. On the back is a clear piece of plastic for you to insert your printed-out QR code under. To dress this up, the accessory comes with a selection of fun paper inserts that also go under the clear plastic. There’s an opening on the back to facilitate hanging this device on the wall. This accessory seems well suited for people who have a rental house or an Airbnb space. Guests can see the Wi-Fi logo prominently printed on the Wifi Porter and use it get on the Internet. It’s unfortunate that Apple put such limitations on NFC that this accessary can’t be set up with an iPhone. And even getting the network details over NFC is a bit cumbersome. There’s nothing Ten One Design can do about that, even though it hobbles the usefulness of this product. Wifi Porter sells for $39.95 on its developer’s website. That seems a reasonable price for people who can take full advantage of all its features. Those who can’t might think hard about just printing out a free QR code. The fancier leather version is $59.95. That’s harder to justify considering the extra cost is just for the appearance of the product. Ten One Design provided Cult of Mac with a review unit for this article. See our reviews policy, and check out more stuff we recommend.